Taken in Italy by Barbara Callis, 2002. History: Risotto is a short grain rice cooked with butter, olive oil, wine, broth and onions. In Italy it is a staple in Northern areas and as far south as Naples. Arborio and Carnaroli rice are cultivated in the Po valley area. There are hundreds of variations of the basic preparation. Adding saffron creates Risotto Milanese, adding Peas, Parmesan, Pancetta and Chives creates Risi Bisi---the list goes on and on. The basics which are low heat on the burner so the onions and rice don't brown but take on a golden hue, letting the rice cook after each addition of stock. It's a misconception that the rice needs to be stirred constantly; stirring often to prevent sticking and after adding the stock is more like it. Cheese isn't added until the few seconds before serving! I like to have a small pitcher of hot stock set at the table for pouring on the cooked risotto to loosen/thin it, as it tends to set-up and get dry because the rice is absorbing the cooking liquids right in the bowl. Cook the onions in olive oil until translucent, add rice and stir to coat with the oil. Add salt and wine and cook until dry. Add hot liquid in 4 batches, stir and cook until creamy before adding more liquid. 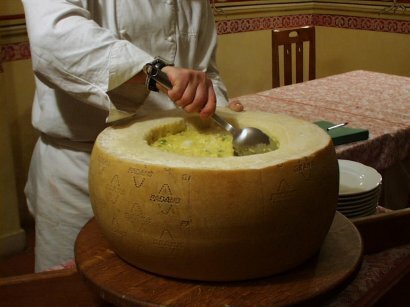 Look at this beautiful photograph of risotto served in a hollowed out wheel of Parmesano Padano. The photo was taken at dinner at the Villa San Lucchese in an area of Tuscany - Poggibonsi. It is risotto being mixed in a parmesan wheel.